Reliance MyJio app, has become the second most downloaded Indian application on the Google Play Store. The app has crossed the 100 million download mark. The first app to achieve this was Hotstar. “MyJio has crossed 100 million downloads on Google Play. 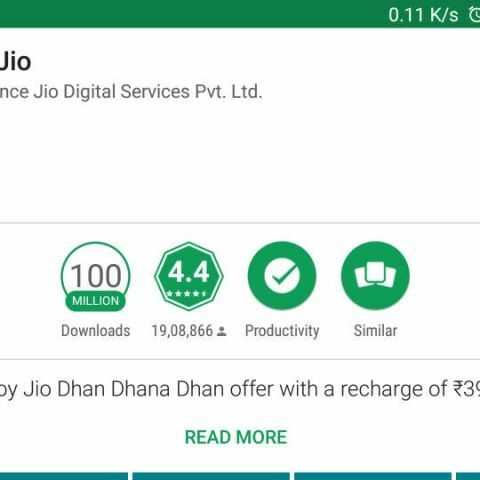 It is the second Indian mobile application to cross 100 million download mark, and first self-care mobile application from an operator,” a source at Reliance Jio, told PTI. Other telecom operators such as Airtel, Vodafone India and Idea Cellular have registered over 10 million downloads on the Google Play Store. Speaking of specific apps from the My Jio app, Jio Music, Jio Cinema have 10 million downloads, Jio TV has 50 million and Jio News Paper has 1 million. To put things into perspective, Netflix has achieved the 100 million download mark where as Prime Video has 10 million downloads on the Google Play Store. Flipkart and Amazon India both have crossed the 50 million download mark.